This story was sent in by one of our readers, Leslie A.L. It's a great story not only about GSD rescue but also about health and doing what it takes to get a sick dog back on it's feet. I hope you enjoy reading it. 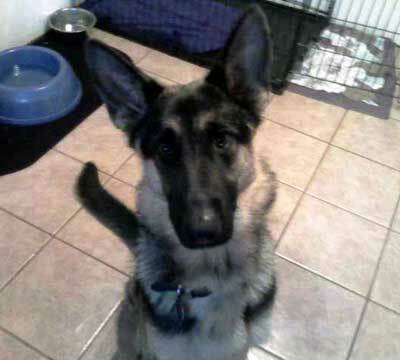 I adopted Titan last November through German Shepherd rescue that had his photo up on Petfinders.com. 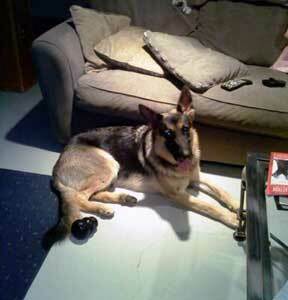 The German Shepherd rescue didn’t know much about him other than he had been abandoned by his previous owner. Titan was a year old when he came home. He was so skinny, almost bordering on being malnourished. He had fleas and round worm but luckily no heart worm. Just a few hours after getting him settled in, he started having seizures. Never witnessing a dog with seizures, I panicked and called the vet. My vet asked if I planned on keeping him. I said that regardless if I keep him or not, I need to know what’s going on so he can be treated. So to the vet’s office we went. To my relief, his blood work came back normal. We weren’t sure if he was having a reaction to both the flea medication and medication to get rid of the round worms so we had to wait until everything was out of his system. I had to record the time and length of each seizure. Although they were heart wrenching to watch, I sat on the floor with him, told him it was okay and would pet him until he came out of it. In the meantime, I was trying to put weight on him as he was 20 lbs underweight. He had a ravenous appetite and I made sure he was eating quality dog food. Although he was gaining some weight, his stool was extremely loose and had a very bad odor to it. It was back to the vet to check for Giardia. Another test, another negative result. I was starting to get discouraged with all the issues Titan was having but the vet said we would get him straightened out and suggested I give him some food that help dogs sensitive stomachs. I started searching the internet to see if there was anything I could find on German Shepherds with digestive problems. I located the Total German Shepherd website and asked if this was something they had ever heard of and how to treat it. It was suggested that I have Titan tested for Exocrine Pancreatic Insufficiency. Sure enough, Titan suffers from EPI. He is given Prozyme on his food which allows him to digest his food. Titan still suffers from seizures but it being controlled with Phenobarbital. He will be on both of these medications for the rest of his life but he is by far the most happy, friendly and funny dogs I’ve ever met. He has brought so much joy in my life. He is an attention getter and when we go for walks, we are constantly be stopped. Titan has his forever home and I am so blessed to have him in my life.